Welcome to AMU, Italian NGO for the development of peoples. We work in cooperation, training and development education and we try to walk every day a new stretch of road to a United World. Join us and enjoy browsing our website! 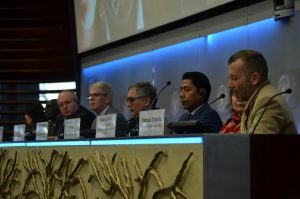 For the 2019 World Water Day, AMU was invited to FAO to talk about its experience in the daily challenge to see the right to water recognized in a concrete and substantial way, through free, widespread and safe access. During the day, which saw representatives of different nations and NGOs involved in the application of the slogan chosen for this year, “No one is left behind”, a number of questions were asked to the various speakers. For AMU, Francesco Tortorella, Project Sector Manager, told our point of view, thanks to the experience gained also with Casobu, AMU’s partner NGO in projects in Burundi, many of which concerning access to drinking water. Below is a summary of his speech. 1. What are the main challenges related water, globally or for your country/organization? Our NGO has been working on water access especially in Burundi, for 15 years. 90% of Burundian population lives in rural areas and 65% are below the local poverty line of 0.85 € per day/per person. But when we talk about water access, measuring poverty in monetary terms does not help us understand the real situation of people. If we consider poverty as deprivation, we can consider the actual access of the household to aspects of well-being such as the quality of drinking water, the type of toilets, school attendance and nutritional balance, or what kind of use do people make of water. The Burundian population (rural and urban combined) with access to drinking water is 75.9%. Thus, only 60% of the Burundian population living in rural areas has access to drinking water. The population without drinking water must use water from rivers or undeveloped sources. The lack of access to drinking water has a direct impact on the health of the population. – From the institutional point of view, water management is provided by municipalities that delegate municipal water boards (structures set up to manage all water resources at the commune level): one of the major challenges is that in the majority of cases, they have operational difficulties related to weakness of technical and financial capacities. – From the community’s point of view, the lack of conception of water as a common good leads to low participation of water users. Considering that more than 90% of the Burundian population lives in rural areas, it is impossible to make running water available in every household. The national policy focuses on providing drinking water to less than 500 mt for rural households. Water users usually do not participate in the price of water service due to lack of confidence in the governance of municipal boards. – The efficient use of water: well used as a drink but not as a good that helps us in our daily hygiene as in the sanitation of the environment, because of lack of education and training. 2.What are the required interventions to address these challenges and achieve the SDGs? 2. Strengthen the capacities and the networking between the key actors in this sector to improve water governance: Institutions, Ministry, Province, Commune, community, beneficiaries, NGOs and civil society. Collaborate and build strong partnerships between state and non-state actors with the participation of communities to put in place a policy that promotes improved water governance. 3. Improve the institutional management capacities about drinking water services, but also at community level, considering water as a common good. So, sensitize the communities on the one hand to be the first protagonists to defend their rights, especially the right of access to drinking water and to develop a conscience turned towards the common good. 4. Promote behavioural change in hygiene. Raise awareness, train and educate communities about hygiene and sanitation. 5. Promote community participation in each stage of water access cycle, to ensure the sustainability of interventions and the real development of communities. The “Water, Spring of Life” project will bring drinking water to about 850 families living on the Rukanda hill, in Bururi (Burundi). After shared projects and goals were set with the local communities, we are now entering the construction phase. Locals will be involved again and everybody will be able to offer his or her contribution to build the infrastructures together with specialised workers and hired labourers. Construction sites are often located in areas not easily accessible or not accessible at all, and therefore in these days we have started to build or renovate the bridges that will allow personnel, equipment, and materials to reach their planned destinations. The Muhondo bridge is one of many that is being renovated: students from a nearby school have joined the official workforce, offering their concrete help to complete the project. Such a spirit of cooperation and direct involvement developed during both planning and construction is one of the most important aspects of this project and will facilitate the project’s future phase where the locals will be in charge of managing the brand new infrastructure and water supply systems in a fare and sustainable way.